The musculoskletal system is a complex system that includes bones, joints, ligaments, tendons, muscles and nerves. Orthopaedics is the medical specialty devoted to the diagnosis, treatment, rehabilitation, and prevention of injuries and diseases of the body’s musculoskeletal system. Learn more about the musculoskeletal system and treatment options. 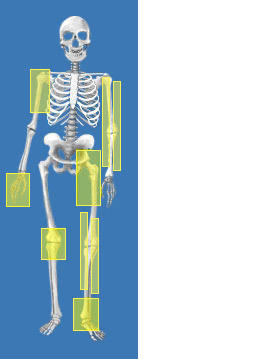 Click on the human skeleton graphic for the joint or bone you’re interested in. We are continually adding information about the musculoskeletal system so check back regularly. Patient information has been reviewed by our Medical & Scientific Review Committee.